The HP TouchPad had a little brother that could have been the TouchPad Go, although it never quite found its way to market.? The 7-inch screen of the tablet remained hidden from view for months,?occasionally?exciting us with a rumour and then returning to its webOS den, like a crafty badger. The TouchPad Go has finally now made an appearance on Chinese ZooPDA forums complete with pictures. 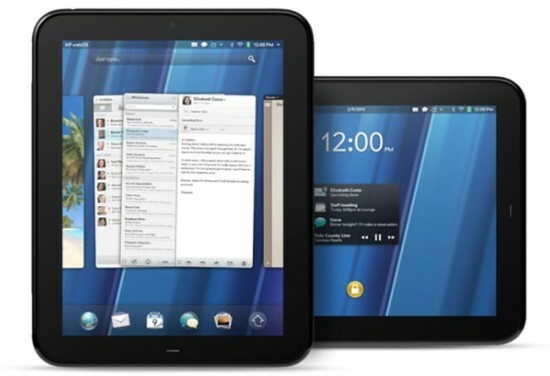 The post shows the 7-inch webOS powered tablet in all its glory, which was reportedly only a few weeks away from getting shipped out to HP fans. The owner has allegedly had his mitts on the tablet for no less than 3 months. A snap of the tablets' specs show a 1.5GHz Qualcomm?APQ8060 Snapdragon processor, 16GB of storage and interestingly an NFC chip.? Unusually for a tablet of this size, the screen sits at a 4:3 aspect ratio. That square 7-inch display also packs the same 1024 x 768?resolution of the released, albeit rare, TouchPad.? HP's gadgets that were or weren't quite ever released are beginning to achieve a bit of a cult status. For all its shortcomings, webOS is damn advanced and as we discovered, plays out nicely on both the TouchPad and Pre 3. Shame then that things like the TouchPad Go remain a Chinese forums-only affair. Still, you could pick a HP tablet up full price, might not be as sweet a deal as the initial ?89 but if you are desperate, they are still out there and the odd eBay bargain can still be grabbed.? Most of the people who bought a HP TouchPad tablet for $99 were dreaming about an Android port on the device and now they’re closer than ever to getting it. Courtesy of the CyanogenMod team things have progressed a lot and now the CM7 ROM is found on the HP TouchPad. There’s a video below showcasing the major functions available now on the tablet. There’s also a benchmark being run on the slate, but the performance was a bit slow, I have to admit. At this time, it seems that only one of the two 1.5GHz cores is active, at least in the demo, so this is the culprit responsible for the slow performance. I always had this curiosity: once Android will be full go on the TouchPad, will anyone want to keep webOS for dual boot purpose? Qualcomm has exclusively told Pocket-lint that it will continue to invest and support webOS in the future, but has ruled itself out of buying the operating system itself. "We are happy to support webOS, whoever buys it," said Cristiano Amon, senior vice president, Product Management at Qualcomm, in a one-to-one chat at the company’s Innovation Qualcomm event in Istanbul. “We don’t make hardware. And it wouldn’t make much sense to own another operating system,"?he added. The statements put to bed a rumour that started when the company’s CEO, Paul Jacobs, sidestepped and somewhat confused the issue just hours earlier in a Q&A; session with journalists and analysts. Asked whether the company was looking to buy webOS from HP, Jacobs told the crowd that he really liked the web-centric operating system and that Qualcomm has put a lot of effort into "that relationship". He also added that the company was "waiting to see exactly what happens". "More choice is better for developers. But it’s really HP’s call at the moment," was the rather cryptic answer. That immediately led some analysts to wonder why Jacobs hadn’t just said "no". Amon also dismissed some reports that suggested a webOS acquisition would help bolster its own mobile phone operating system, BREW:? "We build BREW to show operators that 3G has allowed phones to be more than just voice and text," he told us. If HP does find a buyer, at least it knows that it will be able to run on the latest Qualcomm processors. 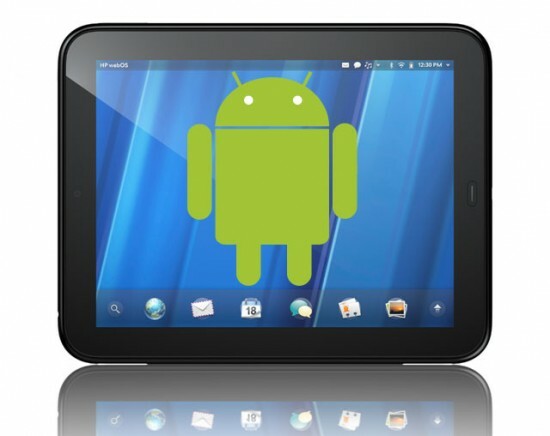 HP TouchPad may not be in the news as often as it used to be when everyone learned that it has reached a price tag of $100, but at least there are some guys out there working tirelessly to bring Android to it. Lots of progress has happened and finally we can say that the touchscreeen works, that being the biggest problem faced by the TouchPad till now. Up until now, the tablet ran Android 2.3.5 and the efforts have been attributed to Team TouchDroid, whose multitouch drivers work perfectly. The TouchPad now detects up to 10 input points at the same time, which is too much for most apps, but still good to see. There’s proof in the video below, if you want it and an Android TouchPad is as close to reality as it gets. It’s nice to see that HP didn’t make any statement on this, neither pro or con as far as Android porting goes. Working WiFi and audio are not certain yet for this build, but the guys are still working on it, so worry not. 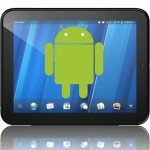 The final result will be a dual boot TouchPad, most likely with webOS and Honeycomb. Yesterday came word that Team-Touchpad had delivered 10-point multitouch to their under-development Gingerbread ROM for the HP TouchPad, but we get the feeling the CyanogenMod 7 build currently in the works might steal its thunder. Ironically, the CyanogenMod team is claiming that the drivers used by the TouchDroid group were actually stolen from from an earlier build of CM7. Appropriately, multitouch is fully enabled in the latest TouchPad CM7 ROM along with hardware graphics acceleration. Still missing, however, is one rather important element: functional WiFi. The eventual plan is to work the hacked version of Android into an easily dual-bootable format along with the TouchPad’s native webOS. But don’t get too excited just yet, there is still much work to be done. A public build is not available at this time, but you can check out the above video to see how things are progressing. If you thought that the HP TouchPad fire-sale was over, then think again as the company has confirmed that one more batch of the webOS-powered tablet will go into production. And, although HP's Mark Budgell doesn't state how many units will be made in the final batch, online rumour mongers estimate that it will be around the 200,000 mark. How many of those will reach the UK is unclear, as is the time frame in which they'll arrive with HP being anything but forthcoming. "We don’t know exactly when these units will be available or how many we’ll get, and we can’t promise we’ll have enough for everyone," said Budgell in a blog post. "We do know that it will be at least a few weeks before you can purchase." It was also confirmed last week that the TouchPad is in-line for a OTA update, making the ?89 device even more attractive. When HP decided to discontinue the HP TouchPad and WebOS after they failed to do anything meaningful with it, they decided to sell out the rest of their stock in a fire sale clearance. This saw the device offered as low as $100 at most retailers and consumers snatched them up like hotcakes on a Sunday morning. Unfortunately, so many people purchased them that stock quickly depleted, but HP decided to do one last production run of the TouchPad to meet lingering demand for the tablet (pending price, of course). If what Mobot.net reports is true, however, no regions outside of North America will be included. "We are pleased by the response to webOS and look forward to customer feedback so we can further enhance the platform. A limited quantity of TouchPads will be available in the coming weeks in North America only. In EMEA we are discontinuing the webOS hardware operations and will not offer any additional products beyond what might be currently available in selective outlets." That’s sad news for our friends in Europe and other regions, if true. With hope that Android will eventually be ported to the tablet thanks to the very dedicated development community, this was one of the hotter items to get at its price point. Perhaps eBay will treat one of you well in the near future, though we’d expect a bit of markup as it’s now become a bit rare. Who would have known that discontinuing a product would be just the ticket to spur on stock-clearing sales? 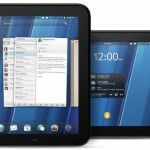 Well, HP experienced the phenomenon first hand after announcing they would cease production of hardware related to webOS, dropping the price of platform’s first tablet to just $99. Due to unprecedented demand, HP has decided to produce one final run of TouchPad’s to fulfill the desires of the tablet hungry. While the manufacturer can’t comment on exactly how many more will be produced, it says they will become available in the next few weeks. This is a much a sacrilege as it gets and only running Flash on the iPad would spoil the Apple picture more. I’m talking here about the iPad Linux port pictured below… We’re already used to such ports, since the PlayBooks’s pretty much Android compatible and the same Google OS has been seen on the HP TouchPad lately. And now… Linux on the iPad. It appears that Linux was also able to run on the iPhone 4 and on the 4th gen iPod touch, but sadly we have no explanation on how the port is done. Of course, it might involve more than your average jailbreak and hacking, so one should keep away, unless he’s skilled enough. Seeing the good old penguin on Apple’s tablet only shows the possibility that these devices offer. In the end, the iPad and its rivals are mere tablet PCs with dual core CPUs and different shells. Verizon’s Nexus Prime to Come Devoid of Any Bloatware?